The Three Gorges Dam on the Yangtze River is the largest feat of engineering between the Himalayas and the edge of the East Asian landmass. Like many other things in modern China, it stems from an enigmatic line in a poem by Mao Zedong, who urged his comrades to 'build a stone wall in the river'. To subdue the waters was a dream that eluded the emperors. Early schemes to build a dam in the Republican period came to naught amid war and chaos. For Mao it was the kind of titanic struggle he relished. He intended to rule the rivers and to send electricity to the cities of a thriving proletariat. The task was left to his successors, principally Li Peng, a dedicated Leninist and hydroelectric engineer who was Prime Minister from 1988 to 1998. Construction began in 1994. By then the dam was more than a hydropower project, it was also a political statement that Communist man had conquered the natural forces that had yoked Chinese peasants to superstition, seasonal floods and famine. It is an achievement so grand, so arduous and so bitter that it deserves examination as a symbol of China's troubled journey into modernity. Most significantly, it has convinced China's leaders that they are right to pursue their next project -- even grander than the Three Gorges Dam -- to divert water from the lush south and the Tibetan plateau to the parched north. On assignment for The Sunday Times, I travelled along the Yangtze three times over ten years between the spring of 1999 and the completion of the dam in 2010. The task meant rising at dawn on misty days, nights spent on ferries fragrant with a thousand migrants, sampans navigating silent gorges, foul food and suspicious hotels. There were sublime moments, too. We joined pilgrims at a doomed pagoda a thousand years old and watched a peasant wake on a low-lying island, soon to be submerged. Over the years, I returned to a Yangtze valley of highways, internet connections and a vigilant state security apparatus that swiftly pounced on us. The languid days of China reporting had vanished along with an old way of life along the Yangtze, both overwhelmed by technology allied to a police state. In the spring of 1999, we landed at the airport in Chongqing, deep in the interior 1,000 miles west of Shanghai. The cityscape was one large building site. The dam was already transforming the infrastructure and logistics of the local economy. On the road to the Yangtze we ran into a riot. Farmers whose lands had been seized were fighting police. It was one of many battles over evictions, compensation, and corruption. In 1999, most went undocumented. The scale of the dislocation was immense. It extended 410 miles along the reservoir, created between Chongqing and the dam. About 1.3 million people had to leave their homes. Four cities, eight towns and 356 villages were submerged. So were 8,000 archaeological sites and 1,610 factories, whose poisons leached into the lake. At each step of the project, the waters rose. Giant placards on the riverside cliffs counted o? the future levels up to the 575ft mark. The planning was meticulous. In Fengdu, known as 'the city of ghosts' we found the guts of the vanquished old China. I described it in a dispatch as 'a harsh world of spitting coolies, incense-filled temples, pestilential drains, bloodstained meat markets and beckoning young prostitutes in dimly lit hairdressing salons.' No wonder the planners in Beijing were happy to see it drown. We sneaked off in a sampan up a tributary buried in the Three Gorges to find peasants living in poverty as in centuries past. A few miles away, new apartment blocks awaited them on the heights. For the state media, this was socialism in action. At cemeteries everywhere below the future water line we saw headstones smashed and the graves opened. Concrete tombs around the new towns stood ready to receive the bones of ancestors, without which the peasants would not move. We sailed on a diversion which allowed boats to skirt the huge site where workers toiled on the dam and its five-stage ship lock. The ferry docked at Yichang, where the Royal Navy's China Station once moored its gunboats. It was in a frenzy of upheaval and building. At the end of the voyage I had seen enough to question how the Chinese government could achieve their goal without major social unrest. Typically for the foreign media of the time, I underestimated the government. It was seven years before I returned. This time I had to record 'a decisive political victory for the Communist Party'. Once again we squeezed on to the ferries, climbed the cliffs to remote villages and stamped through the newly built cities of the heights. At every landing stage there were stories of corruption, compensation denied, stolen property deeds, thugs smashing up houses, false promises of new homes and heavy-handed policing. The last gasp of protest came at a rally by hundreds of farmers in April 2006 at Wushan, a city of 300,000. The police broke it up. The next day a 'political work team' arrived from Chongqing. They ordered every boat to stay in port and imposed identity checks. That marked the end of organized dissent. We did not know it at the time, but it also marked the steady perfection of China's new apparatus of waiwen or 'stability maintenance'. Under the Politburo member Zhou Yongkang, the security forces revitalized the old Maoist neighbourhood spy system, combining it with surveillance technology to mobilize the state for the 2008 Olympics. The conflicts along the Yangtze, therefore, provided a successful test of policing for the rest of China. There was another unpalatable truth for the regime's critics. The party was remarkably successful in creating more winners than losers from the dam. It easily suffocated the miserable protests of peasants, fishermen and old folk. The building boom alone threw off cash and growth in plenty. Jobs in hotels, restaurants, shops and services followed. In Yichang, banners praised the city's expansion from 100,000 to 1.4 million people in only 15 years. It was, they claimed, 'the hydroelectric capital of China'. By 2006, the dam had transformed river trade. Deep waters meant that navigating the Yangtze was no longer con ned to shallow draught sampans and ferries. For the first time, 10,000 tonne vessels could sail from Chongqing to Shanghai, laden with cars, computers, coal and steel. Li had abandoned farming. Ironically, the surge in energy consumption and coal usage reduced the dam's projected share of China's energy output and diminished the proposition that it would have a decisive 'green' effect by reducing greenhouse gases. In 2010, the waters reached their highest level. This marked a triumph for the engineers who dominated the leadership at the time. The party celebrated the formal completion of the dam, although the last of its 26 turbines and electric plants did not enter service until 2012. There was not a unanimous chorus of approval. Along the river, on my third assignment, anyone could see the water stained by sediment churned up by the ships. In the early dry season, it stank. Until then the party had swept aside warnings about the environment from dissident geologists. Now the state media, unable to ignore events with so many people online, admitted that increased seismic activity had led to 97 landslides and that 9,324 dangerous sites had been identified in the first months of 2010. As the water rose, it penetrated fissures and seeped into the soil. Then it loosened the slopes ascending at steep angles out of the river. Eventually, rocks, soil and stones gave way. Giant scars on the cliffs showed where the landslides dumped rubble and soil into the river. These undermined the geology, setting off tremors. Cracks appeared in roads and buildings. In one school, 3,000 children went to daily classes in a block that officials knew to be at risk of collapse. The state news agency, Xinhua, reported that 50,000 residents had already been 'relocated' and that 300,000 would have to move. Experts said a huge settlement of land and water could make the area unstable for 20 years. All this helped push the official cost of the dam to above £18 billion. Independent analysts put the real figure at four times that amount. The leadership allowed discussion of such problems, believing it could still convince the people of the benefits of the dam. Ships sailed deep inland. The economy grew. The annual floods were tamed. Electricity flowed all the way to Shanghai. To clean up the reservoir, 50 waste-water plants were built. The biggest failure was one that continues to preoccupy China's planners: water management. 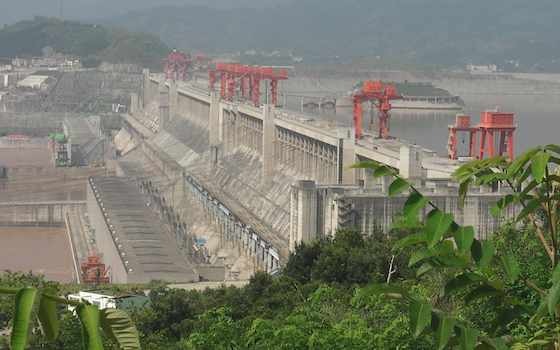 The dam did not relieve drought in the provinces of Hubei, Hunan and Jiangxi because of arguments over how much water to release and when to do it. That has not deterred Chinese leaders from pressing ahead with a huge scheme to carry water from southern China and the Himalayas to the parched plains of the north. New waterways will join the Yangtze to the Yellow River and flow north towards Beijing. The first link, using the 1,500-year-old Grand Canal, is almost complete. The second is due to open next year. A third link will flow from the Tibetan plateau to the Han Chinese heartlands. The 'South-North' project will cost at least £49 billion. Once again, scientists are warning of dire environmental effects. Critics say the money would be better spent on water conservation, better infrastructure and making industry use scarce supplies more efficiently. Chinese leaders are not interested. Their preference for grand projects above complex policy adjustments requiring debate and consent ensures that the 3,000km network of viaducts, pipelines and canals is proceeding. The Three Gorges Dam was a classic of socialist ambition. In historical terms it marked a period of supremacy for the 'construction state' and the 'security state' within the Chinese system. Yet President Xi Jinping's next reforms will not be as simple as building a dam. The new Chinese leaders need to rebalance the economy away from investment and towards consumption. They have also reduced the political influence of the Ministries of Public and State Security, their usual enforcers. That is why they will find the next stages of reform tricky. Nobody should doubt their ability to impose an outcome, as I did in those early years in the doomed towns along the Yangtze. However, authoritarian states are not good at managing complexity. That test is yet to come.